After many months of renovation, restoration, and rehabilitation, we are finally ready to announce our GRAND OPENING! Since the theater was originally opened on Sept. 9th of 1912, we couldn’t think of a better day to reopen. 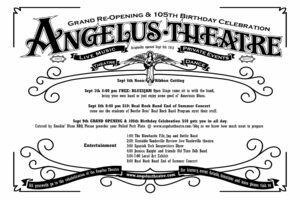 It will double as the 105th birthday of the Angelus! Learn more about our history, here. We will have several events during the week leading up to Sat Sept 9th. Click here for all available tickets. -Wed Sept 6th, High Noon: Ribbon Cutting FREE swing by if you want to see the ribbon cutting. -Thurs Sept 7th, 8pm: BLUESJAM FREE come sit in with the host band, bring your own band, or just enjoy good ol’ American Blues! –Sat Sept 9th: GRAND OPENING!